Day 69: Late Night Flowers I had no idea until I started doing this blog that I was so captivated, engrossed and relentlessly curious about nature’s growth; flowers, trees, leaves, seeds, grass you name it wherever I go I seem to be attracted to the orderly chaos of it all. Now that I have become conscious of this umblical draw I can only deduce that it speaks to a deeper part of me that does not and cannot defer to the realm of logic but rather resides with Wonder in the realm of Awe. I came home from a foray to the shops and Gaby, one of my two model tenants, had gifted me this happy bunch garrulous Spring flowers. Just writing this I thought to google what they might be so I typed in ‘yellow iris lilies‘. I had no idea that there was any such thing. 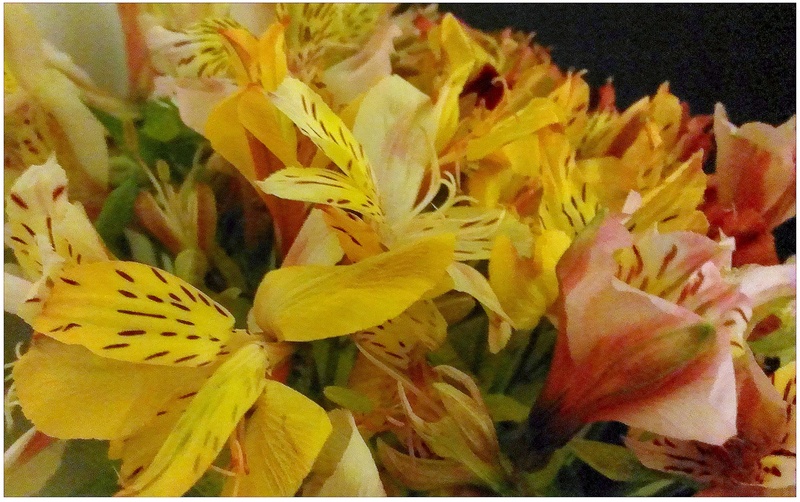 I thought they look a bit like irises, or lilies and they are yellow. Guess what there is such a thing as iris lilies! I had no idea I had this information. Perhaps I don’t. As I said this part of me resides in Awe beyond my rational mind. I took this photo in the late night light just before I turned in for the night bursting with gratitude for flowers and bearers of surprise gifts. Thank you Gaby!